As with most hobbies, the best way to learn is by doing. In this article we'll outline the basic tools and components you might need and we'll talk about a simple project that can serve as a template for your electronics design. 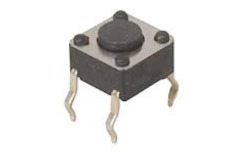 Integrated circuits, specifically digital to analog converters, and 555 timers are essential, as well as IC sockets for them, so that you can easily replace them in case one malfunctions. The breadboard is where it all starts. 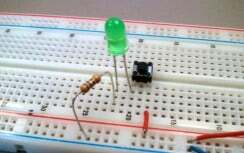 You can build an electronic circuit on a breadboard without any soldering and best of all it is reusable. 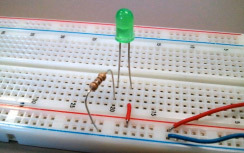 The purpose of the breadboard is to make quick electrical connections between components – like resistors , LEDs, and capacitors – so that you can test your circuit before permanently soldering it onto a PCB. Breadboards have many small sockets on them with some electrically connected to each other. 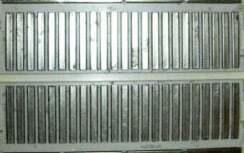 On the underside of the board there are many small metal strips which physically connect certain groups of sockets together and allow electricity to flow freely between them. As we said before, it's easier to learn while doing, so let's get building. Let's build an LED circuit. 1. Place the LED leads into the breadboard (the longer LED lead is the positive side). 2. Put a one end of a jumper wire on the anode side and insert the other end on the positive power bus. 4. Now you're ready to LIGHT UP YOUR LED! 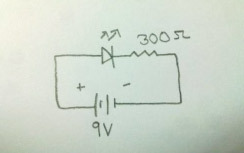 Congratulations - you have just designed an electronic circuit! Now that you're getting the hang of it – let's try something else. 1. Install a pushbutton switch, so it spans the gap running down the middle of the breadboard. 2. Open up the circuit for the LED; break the circle, (shift the LED and resistor over to add-in the switch). 3. Connect the jumper wire from the power bus to one leg of the switch. Connect the anode of the LED to the other leg of the switch that is on the same side as the other connection. Connect the resistor from the cathode of the LED to the ground bus. So before, the flow of electricity went from power, to LED, to resistor, to ground. Now the flow goes from power, to the switch, to the LED, then the resistor, to ground. Hopefully with these simple circuits you're beginning to understand how to get started at electronics design. This simple template was meant to provide you a sense of circuitry being a series of connections between electronics components. Where you go next with your design is up to you – have fun with it! There are many resources online to take off from here. For any one who has ever asked, "How does that work", electronics design is a skill that can be largely self-taught. Forrest Mims is the most widely read electronics author and he is completely self taught in electronics. You can learn all the basics in his comprehensive book, Getting Started in Electronics.